In the setting of autoimmunity, one of the goals of successful therapeutic immune modulation is the induction of peripheral tolerance, a large part of which is mediated by regulatory/suppressor T cells. In this report, we demonstrate a novel immunomodulatory mechanism by an FDA-approved, exogenous peptide-based therapy that incites an HLA class I-restricted, cytotoxic suppressor CD8+ T cell response. We have shown previously that treatment of multiple sclerosis (MS) with glatiramer acetate (GA; Copaxone) induces differential up-regulation of GA-reactive CD8+ T cell responses. We now show that these GA-induced CD8+ T cells are regulatory/suppressor in nature. Untreated patients show overall deficit in CD8+ T cell-mediated suppression, compared with healthy subjects. GA therapy significantly enhances this suppressive ability, which is mediated by cell contact-dependent mechanisms. CD8+ T cells from GA-treated patients and healthy subjects, but not those from untreated patients with MS, exhibit potent, HLA class I-restricted, GA-specific cytotoxicity. We further show that these GA-induced cytotoxic CD8+ T cells can directly kill CD4+ T cells in a GA-specific manner. Killing is enhanced by preactivation of target CD4+ T cells and may depend on presentation of GA through HLA-E. Thus, we demonstrate that GA therapy induces a suppressor/cytotoxic CD8+ T cell response, which is capable of modulating in vivo immune responses during ongoing therapy. These studies not only explain several prior observations relating to the mechanism of this drug but also provide important insights into the natural immune interplay underlying this human immune-mediated disease. Multiple sclerosis (MS)4 is an inflammatory, demyelinating disorder of the CNS affecting over 350,000 people in the United States. Although the etiology of MS is unknown, it is thought to be an immune-mediated disease due to its characteristic histology, the presence of CNS-specific T cell responses, and the ability to modulate the disease using immune-based therapy (1, 2). As a result, several immunomodulatory approaches are being devised for therapeutic intervention in this disorder. The vast majority of studies in human MS and its animal models, such as experimental autoimmune encephalomyelitis (EAE), have focused on evaluating and targeting CD4+ T cell responses. Although both diseases are thought to be mediated and regulated by CD4+ T cells, several reports from our research and others present increasing evidence for a role of CD8+ T cells in the pathogenesis (3, 4, 5, 6, 7, 8) and down-modulation (9, 10, 11, 12, 13, 14, 15, 16, 17, 18) of autoimmune demyelination. However, the mechanisms of immune pathogenesis or regulation in human MS remain unclear. Glatiramer acetate (GA; Copaxone), a synthetic copolymer of alanine, glutamic acid, lysine and tyrosine, is an FDA-approved immunomodulatory therapy for MS. GA was discovered through studies in EAE and was eventually shown to reduce exacerbations and suppress disability in relapsing-remitting MS (19, 20, 21, 22, 23). Several mechanisms have been proposed to explain the effects of GA. Again, studies performed initially in EAE and subsequently in MS have focused on effects on CD4+ T cell responses with the currently favored mechanism being the modulation of CD4+ Th1-type responses to a protective Th2 phenotype, with potential cross-reactivity with myelin basic protein (MBP) (24, 25, 26, 27, 28, 29, 30, 31, 32, 33). Recent reports showing neuroprotection, effects on Ag-presenting cell populations or induction of CD4+ regulatory T cells (34, 35, 36, 37), suggest that the mechanism of action is more complex than Th1/Th2 deviation. Although these studies have suggested several effects of GA therapy, none of them have shown a restoration of any of the immunologic parameters to those seen in healthy subjects. Our studies, using novel immunophenotypic technology, provided the first direct evidence that GA induces not only CD4+, but also CD8+, T cell responses (13). Although untreated patients with MS showed low CD8+ responses to GA, these were differentially up-regulated by GA therapy. We have further shown that this flow cytometric assay system sensitively detects HLA-restricted, Ag-specific CD4+ and CD8+ T cell responses (8) and can be effectively used to dissect the role of these cells in the context of disease. In the current studies, we directly evaluated the role of GA-induced CD8+ T cells, revealing a novel immunologic effect of therapy and providing greater insights into the immune interplay underlying this disease. Healthy volunteers and patients with MS were recruited at the University of Texas Southwestern Medical Center (Dallas, TX). At the time of first leukapheresis, none of the patients had ever been treated with IFN or GA. No steroid treatment was received for at least 3 mo preceding the day of leukapheresis; none were suffering from acute relapses. The age (in years) and gender distribution were as follows for patients with MS: M584-41/F; M971-47/F; M222-53/F; M792-47/F; M626-52/F; M304-50/M; M731-57/M; M705-62/M; M596-41/F; M833-57/F; M295-39/M; M819-58/M and for healthy subjects: H267-48/F; H548-32/M; H333-53/F; H504-36/F; H219-48/M; H847-66/M; H437-23/M. Patients on GA therapy and controls were studied longitudinally. Leukapheresis was performed as approved by the University of Texas Southwestern Institutional Review Board. PBMC, obtained by Ficoll separation of the leukapheresis specimens, were frozen on the day of collection (13). Ag-specific CD4+ or CD8+ T cell responses were quantified by a CFSE-based assay system, as described (8, 13). Briefly, cells were suspended at 1 × 106/ml in PBS and incubated at 37°C for 7 min with 0.25 μM CFSE. Following two serum/PBS washes, cells were suspended in 5% human media (RPMI 1640 with glutamine, 5% human AB serum, penicillin and streptomycin) and cultured with GA (Teva Neuroscience), CMV (Microbix Biosystems), or anti-CD3 (OKT3). On day 7, cells were stained with fluorescent Abs (BD Biosciences) and fixed in 1% paraformaldehyde (BD Biosciences). Data were acquired on a BD FACSCalibur flow cytometer using BD CellQuest software and were analyzed using FlowJo software (Tree Star). As previously described (8, 13), the percentage of cells in the proliferating fraction on day 7 was quantified. Although this number does not directly quantify the in vivo precursor frequency of the responding cells (as many of the cells have divided multiple times), it provides a robust signal-to-noise benefit in such quantification (8, 13). CD8+ T cells were obtained from PBMC, using a magnetic microbead kit from Miltenyi Biotec (positive selection kit; >95% pure CD8+ T cells; <0.1% CD4+ T cells). Similar results were obtained with either negative or positive selection of CD8+ T cells (data not shown). We favored positive selection as this gave the highest purity with negligible CD4 contamination. An aliquot of bulk PBMC was also passed over a similar column without magnetic beads (controlling for the procedure). The bulk as well as CD8-depleted PBMC were stained with CFSE and plated in 96-well U-bottom plates (Corning) at 8 × 104 cells/well. Unstained CD8+ T cells were added to the wells in increasing ratios, as indicated. Thus, the number of CD8+ T cells ranged from 0 to 16 × 104 cells/well. These cells were cultured in a total volume of 200 μl in the presence of media alone, GA (30 μg/ml), anti-CD3 (0.5 μg/ml), or whole CMV Ag (50 μg/ml; Microbix Biosystems). On day 7, the cells were washed and stained as described. The percentage of T cell proliferation was quantified on gated CD4+ T cells. For normalizing the data across different subjects, the proliferation in the absence of CD8+ T cells (1:0 ratio) was considered 100% and the normalized proliferation at other ratios was calculated using the recently described formula by Jiang et al. (18) defined as the percentage of normalized proliferation at test ratio = (percentage of dividing cells at test ratio/percentage of nondividing cells at test ratio)/(percentage of dividing cells at 1:0 ratio/percentage of nondividing cells at 1:0 ratio) × 100, and the percentage of suppression was defined as (100 − percentage of proliferation). As controls for cell numbers, similar cultures were set up with the addition of unstained, CD8-depleted PBMC at the same ratios, with no suppression observed. At ratios 1:2 and beyond, we observed some suppression in the presence of unstained, purified CD4+ cells (data not shown), likely due to active suppression by a small subset of CD4+ T cells (e.g., CD4+CD25+ cells). For the Transwell experiments, Maxicell 0.4-μm tissue culture inserts (Phoenix Research Products) were used to create upper and lower chambers in either 24-well plate wells (BD Falcon) or 17 × 100-mm polystyrene tubes (Fisher Scientific). CFSE-stained, CD8-depleted PBMC were cultured in the lower chamber, whereas purified CD8+ cells were added at various ratios either in the lower chamber (with contact) or upper chamber (without contact). Irradiated CD8-depleted PBMC were added to the upper chamber for stimulation of the CD8+ T cells, which was confirmed by ascertaining proliferation of the CD8+ T cells. Cells were cultured in a total volume of 1.2–1.5 ml with media alone, GA (30 μg/ml), or anti-CD3 (0.5 μg/ml). PBMC were cultured in T25 flasks in the presence of GA (30 μg/ml) and IL-2 (10 ng/ml) for 15 days, with additional IL-2 on day 7. At this time, CD8+ effector cells were obtained using CD8 magnetic microbeads (Miltenyi Biotec). Both positive and negative selection kits were tried initially and worked equally well in the killing assays (data not shown). However, purity of the population was better with the positive selection kit and this was used for most experiments. In some experiments, effector CD8+ T cells were obtained directly from PBMC (ex vivo) without prior culture. Autologous PBMC were stained with CFSE, followed by a 3- to 4-h culture with the relevant Ag (media alone, GA at 50 μg/ml or a pool of 14 CMV previously defined class I peptide epitopes (38) at 2.5 μg/ml each). After culture, cells were washed twice and used as targets in the cytotoxicity assay. In some assays, CD4+ cells were obtained using positive selection kits (Miltenyi Biotec), for use as targets, following incubation of PBMC in media or Con A, with or without GA. In experiments relating to HLA blockade, the anti-HLA class I (G46-2.6; BD Biosciences), anti-HLA-E (MEM-E/02 or MEM-E/08; Abcam) or isotypic control Abs (mouse IgG1κ, MOPC-21; BD Biosciences) were first added to the CFSE-stained cells for 30 min before the addition of Ags (8, 13). These assays were adapted from previously published methodologies (39, 40, 41), which have been shown to correlate with traditional chromium release assays, but offer much greater sensitivity. Briefly, target cells were plated in 96-well U-bottom plates at 5000 cells/well (triplicates for each condition). The effector cells were added at the indicated ratios in a final volume of 200 μl/well. The plates were incubated for 18–24 h, followed by the addition of a constant number of fluorescent allophycocyanin beads (BD Biosciences) as an external control (20 μl of a 1/200 dilution/well). The wells were harvested and run on a BD FACSCalibur flow cytometer. The number of live, CFSE-bright cells was quantified and normalized to the number of beads in each tube. The percentage of lysis was calculated as a percentage of killing = 1 − (live CFSE-bright cells/1000 beads for a particular E:T ratio)/(live CFSE-bright cells/1000 beads at 0:1 ratio) × 100, where 0:1 ratio represents no effector cells. Positive controls were included in every experiment in the form of a redirected lysis assay (42), to ascertain viability and the overall cytotoxic ability of the CD8+ T cells. Briefly, CFSE-stained P815 cells, a mastocytoma cell line that expresses high levels of Fc receptor, were used as target cells. These cells were incubated with anti-CD3 (OKT3, 1.0 μg/ml) before the addition of CD8+ effector cells at the indicated ratios. The assay depends on the binding of anti-CD3 to the Fc receptors, followed by activation of effector cells via CD3, resulting in redirected lysis of target cells (42). A total of 1200 μg of GA was digested by incubation with trypsin (enzyme to substrate ratio 1:20, 37°C; Promega), chymotrypsin (1:60, 30°C; Sigma-Aldrich) or 6 ml of heat-inactivated human AB serum (37°C) for varying periods of time ranging from 5 min to 24 h. HLA-E binding of the digests was tested using the RMA-S cell assay, as described (43, 44). Briefly, RMA-S cells, transfected with HLA-E and β2-microglobulin (a gift from Dr. J. E. Coligan, National Institutes of Health, National Institute of Allergy and Infectious Diseases, Bethesda, MD) were first cultured for 18 h followed by incubation in serum-free X-VIVO-15 media (Cambrex) at 26°C with the various digests (corresponding to 90 μg of original GA) or known negative (MAGE, EADPTGHSY) and positive (B7, VMAPRTVLL) control peptides (300 μM). Cells were then washed and stained for surface HLA-E expression using a cross-reactive PE-conjugated Ab (G46-2.6; BD Biosciences). Student’s t test was used to evaluate quantitative differences between groups. A value of p < 0.05 was considered significant. We showed previously that GA therapy induces a differential up-regulation of GA-specific CD8+ T cell responses (13), suggesting that these cells could mediate immune suppression. In the first set of experiments (Fig. 1⇓), we directly tested this suppressor ability using proliferation assays based on the green fluorescent dye, CFSE (8, 13). Either bulk or CD8-depleted PBMC from GA-treated patients with MS were stained with CFSE. Cell cultures were set up in which increasing numbers of purified, unstained CD8+ T cells were added back to the CD8-depleted PBMC. Replicate cultures were incubated with either GA (stimulating GA-specific CD4+ and CD8+ T cells), anti-CD3 (stimulating all CD4+ and CD8+ T cells), or CMV Ag (stimulating CMV-specific T cells). On day 7, the magnitude of CD4+ T cell proliferation was quantified, based on CFSE dilution, as previously described (8, 13). Fig. 1⇓A demonstrates representative results from a single patient on GA therapy. Fig. 1⇓B shows mean proliferation from six GA-treated patients, whereas Fig. 1⇓C depicts the same data normalized to the proliferation at the 1:0 ratio (absence of CD8+ T cells, designated as 100%). Suppression of CD4+ T cell proliferation by GA-reactive CD8+ T cells. A, A representative patient at 7 mo of daily GA therapy. An aliquot of bulk PBMC was stained with CFSE and used in a CFSE-based proliferation assay (first column). 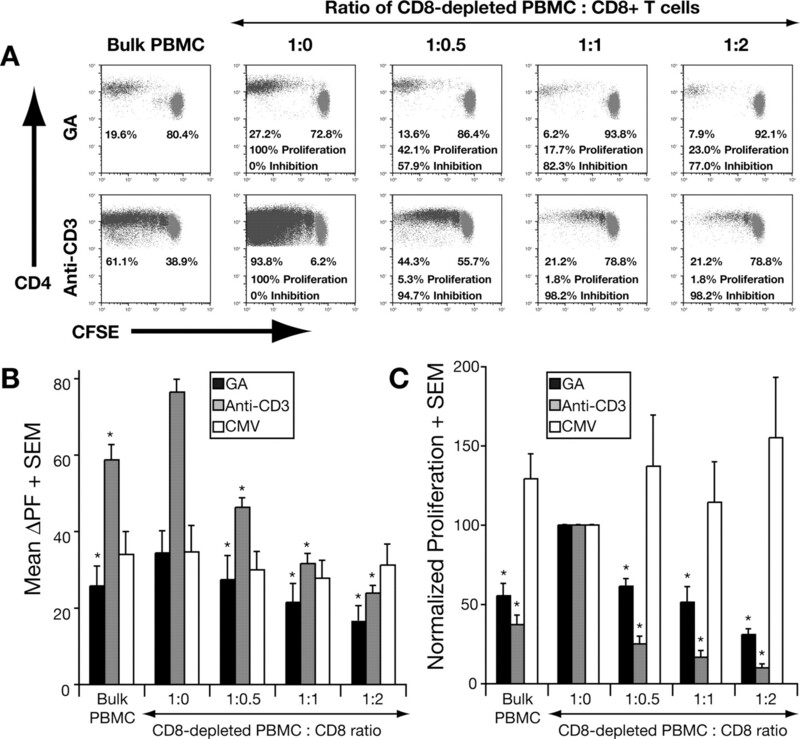 From the remaining PBMC, a purified population of CD8+ T cells was obtained by positive bead selection (>95% pure; <0.1% CD4+ T cell contamination). The CD8-depleted fraction was stained with CFSE and used in a proliferation assay with the addition of increasing numbers of unstained, purified CD8+ T cells, with ratios ranging from 1:0 (no CD8+ T cells) to 1:2. The cells were cultured with either no Ag (data not shown), GA (top row), anti-CD3 (bottom row) or CMV Ag (B and C). On day 7 of culture, cells were stained and the data gated for CD4+ T cells to quantify the proliferating fraction. CD4 vs CFSE staining is shown in the dot plots. The percentages indicated are the fraction of proliferating vs nonproliferating CD4+ T cells. Proliferation (and inhibition) values shown are normalized to the 1:0 ratio. B, The mean proliferation of CD4+ T cells to the indicated stimuli from six patients with MS at 7 mo of treatment. The mean proliferating fraction (ΔPF + SEM, media background subtracted) is shown. ∗, Indicates significantly lower proliferation compared with the corresponding 1:0 ratio. C, shows the same data normalized to the proliferation seen in CD8-depleted PBMC (1:0 assigned a value of 100%). GA-reactive CD4+ T cell responses were significantly enhanced following the depletion of CD8+ T cells (compared with bulk PBMC). The addition of increasing numbers of CD8+ T cells to the cultures caused a progressive and significant decrease in the magnitude of these responses, indicating that activation of GA-specific CD8+ T cells resulted in suppression. Suppression was evident even at ratios of 1:0.5. Of note, only a small fraction of the bulk CD8+ T cells was GA-specific. Thus, at the ratios indicated, GA-specific CD8+ T cells were outnumbered by GA-specific CD4+ T cells in these cultures (13). Suppression of CD4+ proliferation was also observed in the presence of anti-CD3, which is a pan-T cell stimulus, with a consistently higher degree of suppression, compared with GA (Fig. 1⇑, B and C). Thus, in both the GA- and anti-CD3-stimulated cultures, CD8 depletion resulted in a significantly enhanced CD4+ proliferative response and addition of CD8+ cells caused suppression of this response. It is important to note that, unlike [3H]thymidine-based assays, the readout of this assay is the proportion of gated CD4+ T cells in the proliferating fraction and not a total radioactivity count. Thus, the enhancement of proliferation after depletion of CD8+ T cells is not due to increased numbers of CD4+ T cells in the culture, but rather due to an increased proliferation (or survival) on a per cell basis. Moreover, at the ratios indicated, we did not observe suppression using unstained CD8-depleted PBMC instead of CD8+ T cells (cell number controls, data not shown). Thus, the suppression observed in these experiments was not an effect of competition for media nutrients, as also corroborated by the Transwell experiments presented later. At ratios of 1:2 or higher, we observed some suppression if unstained, total CD4+ T cells were added to the anti-CD3-stimulated cultures, likely owing to the presence of the CD4+CD25+ subset (data not shown). Interestingly, although anti-CD3 and GA stimulation showed consistent CD8-mediated suppression, no such recurrent pattern was observed in the CMV-stimulated cultures. Thus, across the patient cohort, the CMV-reactive CD4+ T cell responses were not significantly affected either by depletion or addition of CD8+ T cells (Fig. 1⇑, B and C), suggesting that either the CD8+ T cells were not activated in these cultures or, more likely, CMV-specific CD8+ T cells did not suppress the CMV-specific CD4+ T cell response. Thus, GA- or anti-CD3-stimulated CD8+ T cells, but not CMV-stimulated CD8 cells, were able to consistently suppress CD4+ T cell proliferation. Immune modulation by suppressor T cells could be mediated through direct cell contact and/or through secreted molecules. To delineate the mechanism of CD8+ T cell-mediated suppression, we performed Transwell assays to test the requirement for cell contact. The bottom chamber of the Transwell cultures contained CFSE-stained CD8-depleted PBMC. The purified CD8+ T cells were added either to the bottom chamber (“with contact”) or to the top chamber (“no contact”). Irradiated, CD8-depleted PBMC (APCs) were added to the top chamber to stimulate the CD8+ T cells. The results showed that CD8+ T cell-mediated suppression was largely dependent on cell contact (Fig. 2⇓). This finding was true for cultures stimulated with either GA (Fig. 2⇓) or anti-CD3 (data not shown). The results further confirmed that the suppression was not a simple passive effect of competition for media nutrients but rather an active effect requiring cell contact. As we had observed significant IL-10 and TGF-β expression by GA-specific CD8+ T cells (13), we also performed the suppression assays (with contact) in the presence of anti-IL-10 or anti-TGF-β. However, we did not observe significant reversal of the suppression (data not shown). These results indicate that CD8+ T cell-mediated suppression is predominantly cell contact-dependent, whereas the specific cytokines may play a minor role in this process. Requirement of cell contact for CD8+ T cell-mediated suppression. Suppression assays, similar to those in Fig. 1⇑, were conducted using the Transwell system. CFSE-stained, CD8-depleted PBMC were cultured in the bottom chamber, whereas purified CD8+ T cells were added at various ratios either to the bottom chamber (“with contact”) or the top chamber (“no contact”). Irradiated APC were added to the top well to ascertain stimulation of CD8+ T cells and cultures were stimulated with GA. A, The mean ΔPF (media background subtracted) is shown and represents replicate cultures from a single GA-treated patient. B, The same data are normalized to the proliferation seen in CD8-depleted PBMC (1:0 assigned a value of 100%). The graphs represent data from the 1:1 ratio. There was significant suppression (∗) in the presence of cell contact and this suppression was significantly reversed (∗∗) close to baseline (or above) without cell contact. Similar patterns were observed at other ratios and with anti-CD3 stimulation (data not shown). These results are representative of over 10 separate experiments on cells from six different patients with MS or healthy subjects. In previous studies, we have shown that untreated patients with MS have low GA-specific CD8+ T cell responses (compared with healthy subjects), which are up-regulated by GA therapy (13). Thus, we next asked whether there was a difference in the suppressive ability of CD8+ cells between healthy subjects and untreated patients with MS. Consistent with our hypothesis, we observed that CD8+ T cells obtained from healthy subjects showed robust suppressive ability, which was significantly higher, compared with those from untreated patients with MS (Fig. 3⇓A, p = 0.002). Significant enhancement of CD8+ T cell-mediated suppression following GA therapy. A, Suppression assays were conducted on PBMC from nine untreated patients with MS (▪) and six healthy subjects (•). B, Similar assays were also conducted on longitudinal specimens (▴) obtained at 7 mo of GA therapy (six patients) as well as on PBMC from four subjects without treatment at the same intervals (C). The untreated subjects included two patients with MS (two upper symbols) and two healthy individuals (two lower symbols). A, The horizontal bars represent mean percent proliferation. B and C, Each line represents data from the same subject at the two time points. To keep the quantified population consistent across experiments, CD8+ T cells from each time point were added to autologous CD8-depleted cells from both the 0-mo as well as 7-mo time points. All graphs show representative data from the 1:1 ratio using CFSE-stained CD8-depleted PBMC from the untreated (0 mo) time point and anti-CD3 as the stimulating agent (a similar trend was observed at other ratios and using PBMC from the treated time point). The proliferation of CD4+ T cells (lower the proliferation, higher the suppression) is shown. Each point represents data from a single subject. 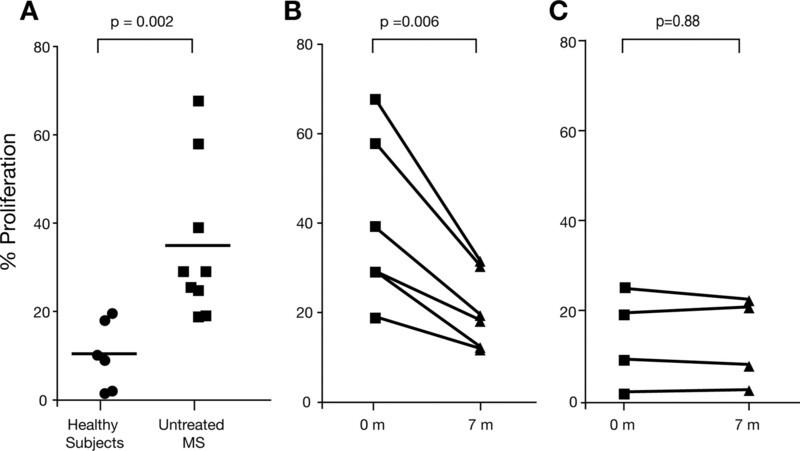 The results in A demonstrate a significantly (p = 0.002) lower suppressive ability of CD8+ T cells in untreated patients with MS, compared with healthy subjects. This ability was significantly (p = 0.006) up-regulated following GA therapy (B), but not in the absence of therapy (C) (p = 0.88). We further tested whether this ability was affected by GA therapy. Fig. 3⇑B represents longitudinal analysis of six patients with MS who were treated with GA for 7 mo, whereas Fig. 3⇑C shows four subjects who did not receive any immunomodulatory therapy over the same time frame. Several points are noteworthy. First, there was a significant enhancement in the suppressive ability of CD8+ T cells following GA therapy (Fig. 3⇑B). Although untreated patients started with a variable degree of CD8+ T cell-mediated suppression (Fig. 3⇑A), this was consistently enhanced by GA therapy (Fig. 3⇑B; p = 0.006). Second, the four untreated subjects (two healthy and two with MS), whose samples were processed and evaluated in a similar time frame and in a similar manner (including pheresis and freezing), did not show consistent or significant change in CD8+ T cell-mediated suppression (Fig. 3⇑C). PBMC specimens from other untreated healthy subjects were available over a shorter (3 mo) time frames and showed similar results (data not shown). Finally, the enhancement of suppression was not restricted merely to GA-specific suppression (data not shown), but rather GA therapy resulted in the enhancement of the overall suppressive potential measured by anti-CD3-mediated stimulation (Fig. 3⇑, A and C). One of the major effector functions of CD8+ T cells that requires cell contact is their cytotoxicity. Thus, we hypothesized that the cell contact-dependent suppression observed in these experiments may be mediated by cytotoxic killing of immune cells. To test this possibility, we adapted a flow cytometry-based cytotoxicity assay, which is highly sensitive and avoids use of radioactivity (39, 40, 41). In the first set of experiments, PBMC from GA-treated patients with MS were cultured in the presence of GA for 15 days. We obtained purified CD8+ T cells from these cultures to serve as effector cells. CFSE-stained autologous PBMC, loaded with the indicated Ags (no Ag, GA, or CMV peptides), served as the target cells. Every experiment included a positive control in the form of a redirected lysis assay (see Materials and Methods). Fig. 4⇓A is representative data from a single patient at 3 mo of GA therapy, whereas Fig. 4⇓B shows compiled data from five such patients. Thus, we could robustly detect GA-specific killing with increasing E:T ratios. GA-specific, HLA-restricted CD8+ T cell-mediated cytotoxicity in GA-treated patients with MS and healthy subjects, but not untreated patients. Flow cytometric cytotoxicity assays were conducted using purified CD8+ T cells as effector cells and CFSE-stained PBMC as targets, loaded either with no Ag, GA, or CMV peptides. CFSE-stained P815 cells with anti-CD3 served as positive controls (redirected lysis), as described in Materials and Methods. A–C and E, Effector cells were obtained from in vitro PBMC cultures stimulated with GA and IL-2. D, Ex vivo purified CD8+ T cells served as effectors. A, Results from a representative patient with MS at 3 mo of GA therapy. Mean percentage + SEM of specific killing with various E:T ratios are plotted. B, Data from five patients with MS at 3 mo of therapy. No appreciable killing was detected of targets loaded with either no Ag or with CMV peptides. Robust GA-specific killing was detected with increasing E:T ratios. C, Longitudinal GA-specific killing from the same five patients with MS at the untreated time point and at 3 and 11 mo of GA therapy. In addition, GA-specific killing of four healthy subjects is also shown. No detectable killing was observed from untreated patients with MS. Compared with untreated patients, there was significantly (∗) higher GA-specific cytotoxicity in healthy subjects as well as following GA therapy. D, Five GA-treated patients with MS at 3 and 11 mo of therapy, showing detectable GA-specific killing by ex vivo-purified CD8+ T cells. E, Mean specific killing from four GA-treated patients with MS is shown. These assays were conducted in the presence of anti-HLA-class I Abs (or isotypic control IgG). Significant (∗) suppression of killing in the presence of anti-HLA class I Abs is shown. Once GA-specific killing was demonstrable in treated patients, we next performed these assays on longitudinal specimens obtained at the untreated time point as well as at 11 mo of therapy (Fig. 4⇑C). GA-specific killing was undetectable in CD8+ T cells from untreated patients with MS, whereas it was significantly up-regulated at 3 or 11 mo of GA therapy. We also assessed the GA-specific cytotoxic ability of healthy subjects, who had no in vivo exposure to GA. In contrast to untreated patients with MS, healthy subjects showed detectable levels of GA-specific cytotoxicity (Fig. 4⇑C), albeit at a level lower than patients receiving daily in vivo GA therapy. Thus, untreated MS was characterized by a deficiency of GA-specific CTL activity, which was dramatically up-regulated by GA therapy. This finding was in keeping with the differences between healthy subjects and untreated patients with MS in their suppressive ability (Fig. 3⇑) and magnitude of GA-reactive CD8+ T cells (13). Cytotoxicity assays for human CTL depend on an in vitro activation step, even in the case of several antiviral CTL responses. As GA therapy is administered daily, we asked whether we could detect ex vivo cytotoxic ability in GA-treated patients (without prior in vitro activation). We could indeed detect ex vivo GA-specific killing from patients treated for 3 or 11 mo (Fig. 4⇑D), understandably at a lower magnitude compared with the 15-day cultures. To conserve cells, we did not perform these experiments on PBMC from the untreated time point as they did not exhibit cytotoxic killing even after prior in vitro stimulation (Fig. 4⇑C). These results indicate that GA-specific cytotoxic T cells are active in vivo in GA-treated patients. In parallel experiments, we also confirmed the up-regulation of perforin-expressing GA-specific CD8+ T cells in treated patients, corroborating these killing experiments (data not shown). We then performed these cytotoxicity assays in the presence of anti-HLA class I Abs (and appropriate isotypic control), as demonstrated in Fig. 4⇑E. Anti-HLA class I Abs significantly inhibited GA-specific killing, indicating that this cytotoxic effect was Ag-specific and MHC-restricted. Suppressor/cytotoxic CD8+ T cells may mediate their effects through a combination of mechanisms, one of which is killing of target CD4+ T cells (15, 16). We could directly test for this possibility in cytotoxic assays. Thus, instead of bulk PBMC, we used purified CFSE-stained, GA-loaded CD4+ T cells as the target cells. Fig. 5⇓A demonstrates that CD8+ T cells from GA-treated patients could directly kill autologous CD4+ T cells in a GA-specific manner. This assay system did not allow for the testing of monocytes or dendritic cells as potential targets due to a combination of methodological issues, including cell numbers and cell adhesion to plates. Nevertheless, the results allow us to conclude that CD4+ T cells are one of the potential targets of GA-specific cytotoxicity. Killing of CD4+ T cells by GA-specific CD8+ T cells. Flow cytometric cytotoxicity assays were conducted using CD8+ T cells from GA-treated patients with MS as effectors and CFSE-stained, purified, autologous CD4+ T cells as targets. A, Results from one such assay are shown and are representative of five replicate experiments on five patients. B, Significantly (∗) enhanced GA-specific killing of CD4+ T cells following preactivation with Con A is shown and is representative of three separate experiments. We next hypothesized that killing of CD4+ T cells would be enhanced following preactivation, as the activation of CD4+ T cells results in the up-regulation of HLA class Ia and class Ib molecules. Thus, greater numbers of cells would express higher levels of the relevant restricting element and could be appropriately loaded with GA. Thus, we performed cytotoxicity assays with purified, CFSE-stained CD4+ T cells obtained from PBMC cultures that were preincubated in media alone or prestimulated with Con A (with or without GA). As predicted, we observed significantly greater killing of Con A-stimulated CD4+ T cells (Fig. 5⇑B). Importantly, this killing was still GA-specific as killing of activated cells without GA was not appreciably greater than that of nonactivated cells without GA. These results also indicate that killing/suppression of CD4+ T cells by GA-specific CD8+ T cells is not restricted to GA-specific CD4+ T cells, but rather to activated T cells that can be appropriately loaded with GA. In reports studying regulatory CD8+ T cells in mouse models, the cytotoxic activity of these cells is shown to be restricted by nonclassical class I molecules, specifically Qa-1 (15, 16, 17, 18). Similar activity has been seen in human CTL, restricted by the Qa-1 homolog, HLA-E (45). The anti-HLA-class I Ab that we used in Fig. 4⇑E (clone G46-2.6) cross-reacts with HLA-E and thus, part of the inhibition could have been mediated by HLA-E blockade. Thus, we next tested whether GA-specific activity of CD8+ T cells may be HLA-E restricted, by using specific anti-HLA-E Abs (clones MEM-E/02 or MEM-E/08). First, in cytotoxicity assays, we observed that the addition of anti-HLA-E significantly blocked GA-specific killing of CD4+ T cells in four of five tested subjects (Fig. 6⇓A). In one of five subjects, anti-HLA-E had minimal effect on GA-specific killing of CD4+ T cells (data not shown), suggesting that killing was predominantly classical HLA-restricted in this subject. 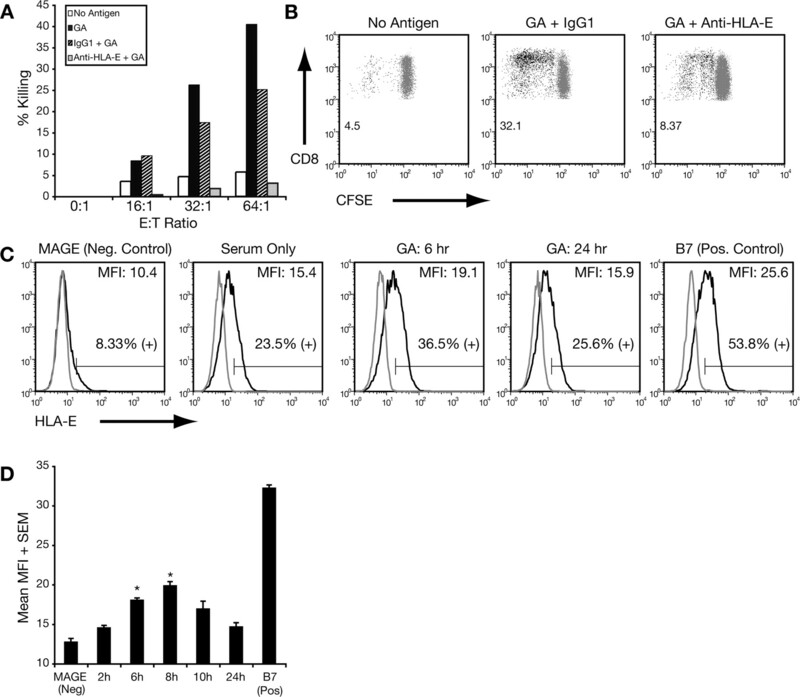 HLA-E restriction of GA-specific CD8+ T cells. A, Flow cytometric killing assays, similar to those in Fig. 5⇑, were conducted in the presence of anti-HLA-E or appropriate control. Significant inhibition of killing was observed in the presence of anti-HLA-E Ab and is representative of results from four patients. B, Represents a proliferation assay conducted on purified, CFSE-stained CD8+ T cells, incubated with irradiated PBMC that were pulsed for 3 h with GA (or media alone) in the presence of anti-HLA-E, control IgG, or anti-HLA-A, -HLA-B, and -HLA-C (data not shown). The values indicated are the proportion of proliferating cells. The results are representative of four separate experiments. C and D, HLA-E binding assays. GA was incubated with heat-inactivated serum for varying periods of time. RMA-S cells transfected with HLA-E and β2-microglobulin were incubated with the indicated GA digests or negative and positive control peptides, followed by staining for surface HLA-E expression. C, Flow histograms from a single experiment. Gray histograms represent isotype controls, whereas the thick black line histograms represent HLA-E staining. Mean fluorescence intensity (MFI) of HLA-E staining is indicated at the top, whereas percentage at the bottom represents positive staining beyond negative cutoff. D, A graphical representation of the mean fluorescence intensity (MFI + SEM) of triplicate conditions from a replicate experiment. The 6- and 8-h digests showed significantly (∗, p < 0.05) greater staining for HLA-E, compared with the baseline or 2-h time points. The 10- and 24-h time points were comparable to the baseline. Furthermore, GA-induced proliferation of purified CD8+ T cells was also significantly blocked in the presence of anti-HLA-E (Fig. 6⇑B), as well as anti-HLA-A, -HLA-B, and -HLA-C (Ref. 13 and data not shown). Neither reagent blocked proliferation in response to anti-CD3-mediated stimulation (data not shown). These results show that the GA-induced CD8+ T cell response is, at least in part, HLA-E-restricted. As we could not completely block GA-induced proliferation with anti-HLA-E, this may indicate that a subpopulation of CD8+ T cells is restricted by HLA class Ia molecules (13). Finally, we used the RMA-S cell assay to test for GA binding to HLA-E. Although it is known that intact GA can directly bind to class II molecules (46), it is entirely possible that processed or cleaved GA may be presented on class Ia or class Ib molecules. The optimal binding motif for HLA-E has been reported (47). With regard to GA (amino acids A, K, D, and Y), it is interesting that A and K are important amino acids in some of the anchor positions of this motif (47). However, GA does not contain amino acids M, L, Q, E, or F, which are also important anchor residues. Thus, although a perfect HLA-E binding motif does not exist within GA, weak binding may be a possibility following processing/cleaving. Such digestion may be intracellular and use cross-presentation pathways or may potentially occur as extracellular proteolysis following GA injection. To mimic GA digestion in vitro, we incubated GA with trypsin, chymotrypsin or serum for varying periods of time and used the “digest” to evaluate for binding potential. With trypsin or chymotrypsin digestion, we did not observe reproducible binding (not shown). However, with serum digests, we observed weak binding to HLA-E (Fig. 6⇑, C and D), compared with relevant controls (serum only or negative control peptides). This binding was observed after 6–8 h of digestion, but not seen with fresh GA, within the first 2–4 h or following overnight incubation, suggesting that the appropriate-sized molecules (9- or 10-mers) were probably generated in the 6–8 h time frame. As the expression of HLA-E was weak, we performed the binding assays in triplicates to take into account intra-assay variability (Fig. 6⇑D). Although the binding was not as strong as the optimal HLA-class I leader sequence (positive control), our data suggest that the weak binding may still be functionally relevant, as indicated by the Ab blockade experiments (Fig. 6⇑, A and B). Overall, this suggests that GA can be cleaved or processed into HLA-E binding peptides, albeit weak binders, which may then form functional ligands for CD8+ T cells. In our bulk proliferation/suppression assays (Fig. 1⇑), we could only test the ability of GA-specific CD8+ T cells to modulate GA-specific CD4+ T cells, owing to the high GA-specific reactivity in human subjects. However, the killing assays indicated that interaction of GA-specific CD8+ T cells is not necessarily restricted to GA-specific CD4+ T cells. Rather, the targets for GA-specific CD8+ T cells are cells that can appropriately load GA into their class I molecules (Figs. 5⇑ and 6⇑). To test this possibility further, we established CD4+ T cell lines specific for MBP, tetanus toxoid (TT) or GA (as a control). We ascertained that the MBP- and TT-specific lines did not show proliferative responses to GA (data not shown). Using these lines, we could test the ability and specificity of GA-reactive CD8+ T cells to suppress other CD4+ T cells (Fig. 7⇓). CFSE-stained CD4+ T cells were incubated with irradiated PBMC and varying ratios of ex vivo-purified CD8+ T cells (1:0, 1:0.5, 1:1), along with the indicated combinations of Ags. Thus, CD4+ T cells of different reactivities, including MBP (Fig. 7⇓A), TT (Fig. 7⇓B) and GA (data not shown), were significantly suppressed by CD8+ T cells in the presence (but not absence) of GA.
Suppression of MBP- and TT-specific CD4+ T cells by GA-specific CD8+ T cells. Long-term MBP- or TT-specific CD4+ T cell lines were cultured and the absence of reactivity against GA was ascertained (data not shown). These CD4+ T cells were stained with CFSE and cultured with irradiated, CD8-depleted autologous PBMC and varying ratios of autologous CD8+ T cells from GA-treated patients with MS. An MBP-specific line from patient M304 (A) and a TT-specific line from M819 (B) are shown. The data represent proliferation that is normalized to the 1:0 ratio (no CD8+ T cells), in the presence of the indicated Ags. Data are representative of four separate experiments. Thus, robust suppression was observed only in the presence of both GA as well as CD8+ T cells (▪). A large part of peripheral tolerance depends on active down-modulation of immune responses by regulatory/suppressor T cells. It has become clear that CD4+CD25+ T regulatory (Treg) cells are important native (or induced) regulators of the immune system. This subpopulation of T cells has generated tremendous scientific interest and undergone extensive characterization (reviewed in Ref. 48). In fact, recent reports demonstrate the relevance of this subset of cells in immune mechanisms underlying MS (49) and GA therapy (37). However, several reports have suggested that subsets of CD8+ T cells also possess regulatory ability. After a period of disfavor, the CD8+ suppressor T cell has undergone somewhat of a revival (16, 50). This population is not as well characterized, but it is becoming clear that CD8+ T cells serve an important regulatory function in controlling autoimmune destruction (9, 12, 15). It is unclear whether this population is defined by lack of CD28 expression (14), Qa-1-restricted cytotoxicity (16, 17) or ability to alter Ag-presenting cell function or whether (and more likely) these are distinct examples of induced regulatory cells. Moreover, the role of these cells in human autoimmunity has been largely ignored. In the current report, we characterize therapeutically induced CD8+ T cells in MS. In previous studies (13), we provided the first immunophenotypic evidence that GA therapy induces not only CD4+ but also CD8+ T cell responses. Untreated patients with MS show low GA-reactive CD8+ T cell responses, which are differentially up-regulated by therapy. We now show that GA-induced CD8+ T cells indeed possess suppressor/cytotoxic functions, which is mediated, at least in part, by GA-specific cytotoxicity. This cytotoxic suppressive ability is deficient in untreated patients with MS and is significantly up-regulated in GA-treated patients. To our knowledge, this study is the first elucidated mechanism of GA, wherein the therapy induces a restoration of an immune parameter that is deficient in untreated patients (as compared with healthy individuals). We further demonstrate that CD4+ T cells may be a potential target for GA-specific cytotoxicity, which may be, at least in part, HLA-E-restricted. Thus, the suppressor ability of GA-induced CD8+ T cells may be mediated by direct cytotoxic killing of critical immune populations. Through these studies, we have uncovered a novel mechanism of immune modulation by an FDA-approved therapy in a human immune-mediated disease. It has long been thought that the immune system of patients who have MS may be deficient in suppression. We show that this dysregulation is not restricted to defective CD4+CD25+ Treg cells. As suggested by several older reports (9, 10, 11), there is clearly an overall deficit of CD8+ T cell-mediated suppression in MS. Interestingly, therapy with GA, a random copolymeric drug discovered through studies focused on CD4+ T cells, results in distinct up-regulation of this ability. TCR vaccination is another therapeutic setting in which a CD8+ T cell-mediated mechanism has been suggested in prior reports (45, 51, 52, 53). The presence of GA-specific CD4+ and CD8+ T cell responses in healthy subjects, who have never been exposed to GA is an intriguing feature, largely attributed to cross-reactivity of T cells with randomly presented peptides. Beyond CD8 proliferative responses, we also observed the presence of GA-specific cytotoxicity in healthy subjects. This observation is of great interest and may provide the opportunity to reveal the “true specificity” of these purportedly cross-reactive cells. Although several mechanisms may be at play, GA-induced CD8+ T suppressor cells appear very similar to Qa-1-restricted, suppressor/cytotoxic CD8+ T cells described in murine systems (15, 16, 17, 18). However, the antigenic specificity in the murine system is unclear and is probably represented by a self-peptide presented in the context of the Qa-1 molecule (15, 16, 17, 18). GA-induced CD8+ T cells, although similar in many respects, are clearly GA-specific in that they need to detect GA on their target population. As suggested by the class I blockade studies, the targets for GA-specific CD8+ T cells appear to be cells that can appropriately load GA into their class Ia or class Ib molecules. Immune cells can process exogenous Ags and cross-present them in the context of classical or nonclassical class I MHC (54, 55). Loading of an extrinsic Ag like GA into HLA class I molecules may require such cross-presentation. It is also possible that GA may be processed into fragments extracellularly (hydrolytic degradation) or by another cell type and then get loaded onto surface class I molecules of the potential target. The biology of such cross-presentation and the particular family of 9-mers that are generated in vivo still need to be addressed in future studies. However, it is tempting to speculate that this requirement may provide some degree of specificity by limiting the eligible target populations in vivo. Thus, not every cell with HLA class I would be an appropriate target for GA-induced CD8+ T cells. Rather, cells that are efficient at cross-presentation of Ags or express adequate levels of classical or nonclassical HLA molecules (such as HLA-E) may be the relevant targets, potentially restricting the target populations to immune cells actively involved in an ongoing immune response. Qa-1-restricted CD8+ T cells are induced, nonanergic cells that have been shown to preferentially kill activated, Th1-type CD4+ T cells in some systems, resulting in immune deviation toward Th2. Interestingly, GA therapy also results in deviation of CD4+ responses from Th1 to Th2. It is thus possible that this deviation is a result of GA-induced suppressor CD8+ T cell responses. This theory is borne out by our observations that GA-specific CD4+ T cells show continual clonal evolution of their T cell repertoire, whereas the same dominant clones of GA-specific CD8+ T cells persist long-term in patients on GA therapy (B. W. Biegler, S. X. Yam, D. K. Tennakoon, S. B. Ortega, M. K. Racke, and N. J. Karandikar, manuscript in preparation). Regulatory CD8+ T cells have also been shown to modulate APCs (14). GA-treated patients and PBMC cultures show changes in APC populations (34, 35, 36) that may also be mediated, in part, by GA-specific CD8+ T cells. Thus, the mechanism of action of GA is far more complex than appreciated thus far and is clearly not limited to mere immune deviation of CD4+ T cells. Regulatory CD8+ T cells are thought to be housed in the CD8+CD28− subset (11, 14). Chronic exposure to Ag can result in the CD8+CD28− phenotype (56, 57), similar to the CD4+CD25+ phenotype of acquired Treg cells. GA therapy, which is one form of chronic antigenic exposure, results in higher numbers of CD28−CD57+ cells among the GA-reactive CD8+ T cells (our unpublished observations). However, we have observed suppressive ability in both the CD28+ as well as CD28− subsets (data not shown). Although the emerging population of CD28−, GA-specific CD8+ T cells possesses cytotoxic and suppressor properties, these functions are probably not entirely contained in that subset. Thus, similar to the presence of CD25 on CD4+ T cells, the absence of CD28 on CD8+ T cells correlates with regulatory/cytotoxic function, but does not necessarily (or sufficiently) predict such functionality. Expression of the transcription factor, Foxp3, has been associated with CD4+CD25+ Treg cells and appears to be necessary and sufficient for Treg function (58, 59). A recent report has also suggested that GA therapy may induce CD4+CD25+ Treg cells through Foxp3 expression (37). Interestingly, in studies on human T cells, Foxp3 expression has also been shown in CD25− Treg cells as well as CD8+ T cells (60, 61). In preliminary studies, we could also detect the message for Foxp3 in flow-sorted, GA-specific CD8+ and CD4+ T cells (our unpublished observations). However, the significance of this finding in the context of human CD8+ T cells is still unclear. The current study was designed to gain mechanistic insights into the drug’s action and was not powered to assess the clinical relevance of these findings. Although all the patients on GA therapy in this group are clinically stable, we cannot draw specific clinical conclusions from this small group. However, these mechanistic insights provide the framework for future larger studies in which the significance of GA-induced CD8+ T cells could be tested in the clinical context. These types of assays may then serve as important monitoring tools to ascertain the predicted immune effects of the drug or to pick the relevant drug in a given patient. Mechanistic insight is critical for the design of future therapies, be they new compounds targeting limited immune populations or combinations of existing drugs. As a simple example, as GA-induced active immune regulation appears essential for its modulatory effects, it would make better sense to provide GA therapy before the addition of immunosuppressive drugs to the therapeutic regimen. To summarize, our studies demonstrate a novel mechanism of therapeutic immune regulation in MS and uncover fundamental aspects of natural interplay between human regulatory and effector T cells. This aspect of immune modulation may have implications in other immune-mediated disorders and these studies should hopefully pave the way for intensified investigation in these settings. We thank Becky Price for performing the leukapheresis. ↵1 This work was supported in part by Research Grants AI49990 and AI53439 from the USPHS National Institutes of Health (to N.J.K. ), Grant JF2118-A-2 from The National Multiple Sclerosis Society (to N.J.K. ), Grants NS37513, AI47133, and NS044250 from the National Institutes of Health (to M.K.R. ), and Grant RG2969-B-7 from The National MS Society (to M.K.R.). N.J.K. is a Harry Weaver Neuroscience Scholar of the National MS Society. ↵2 D.K.T. and R.S.M. are co-first authors who contributed equally to this work. ↵4 Abbreviations used in this paper: MS, multiple sclerosis; GA, glatiramer acetate; EAE, experimental autoimmune encephalomyelitis; MBP, myelin basic protein; TT, tetanus toxoid; Treg, T regulatory. Arnason, B. G.. 1983. Relevance of experimental allergic encephalomyelitis to multiple sclerosis. Neurol. Clin. 1: 765-782. Martin, R., H. F. McFarland, D. E. McFarlin. 1992. Immunological aspects of demyelinating diseases. Annu. Rev. Immunol. 10: 153-187. Huseby, E. S., D. Liggitt, T. Brabb, B. Schnabel, C. Ohlen, J. Goverman. 2001. A pathogenic role for myelin-specific CD8+ T cells in a model for multiple sclerosis. J. Exp. Med. 194: 669-676. Sun, D., J. N. Whitaker, Z. Huang, D. Liu, C. Coleclough, H. Wekerle, C. S. Raine. 2001. Myelin antigen-specific CD8+ T cells are encephalitogenic and produce severe disease in C57BL/6 mice. J. Immunol. 166: 7579-7587. Monteiro, J., R. Hingorani, R. Peroglizzi, B. Apatoff, P. K. Gregersen. 1996. Oligoclonality of CD8+ T cells in multiple sclerosis. Autoimmunity 23: 127-138. Babbe, H., A. Roers, A. Waisman, H. Lassmann, N. Goebels, R. Hohlfeld, M. Friese, R. Schröder, M. Deckert, S. Schmidt, et al 2000. Clonal expansions of CD8+ T cells dominate the T cell infiltrate in active multiple sclerosis lesions as shown by micromanipulation and single cell polymerase chain reaction. J. Exp. Med. 192: 393-404. Tsuchida, T., K. C. Parker, R. V. Turner, H. F. McFarland, J. E. Coligan, W. E. Biddison. 1994. Autoreactive CD8+ T-cell responses to human myelin protein-derived peptides. Proc. Natl. Acad. Sci. USA 91: 10859-10863. Crawford, M. P., S. X. Yan, S. B. Ortega, R. S. Mehta, R. E. Hewitt, D. A. Price, P. Stastny, D. C. Douek, R. A. Koup, M. K. Racke, N. J. Karandikar. 2004. High prevalence of autoreactive neuroantigen-specific CD8+ T cells in multiple sclerosis revealed by novel flow cytometric assay. Blood 103: 4222-4231. Antel, J., M. Bania, A. Noronha, S. Neely. 1986. Defective suppressor cell function mediated by T8+ cell lines from patients with progressive multiple sclerosis. J. Immunol. 137: 3436-3439. Karandikar, N. J., M. P. Crawford, X. Yan, R. B. Ratts, J. M. Brenchley, D. R. Ambrozak, A. E. Lovett-Racke, E. M. Frohman, P. Stastny, D. C. Douek, et al 2002. Glatiramer acetate (Copaxone) therapy induces CD8+ T cell responses in patients with multiple sclerosis. J. Clin. Invest. 109: 641-649. Jiang, H., L. Chess. 2004. An integrated model of immunoregulation mediated by regulatory T cell subsets. Adv. Immunol. 83: 253-288. Chess, L., H. Jiang. 2004. Resurrecting CD8+ suppressor T cells. Nat. Immunol. 5: 469-471. Jiang, H., Y. Wu, B. Liang, Z. Zheng, G. Tang, J. Kanellopoulos, M. Soloski, R. Winchester, I. Goldstein, L. Chess. 2005. An affinity/avidity model of peripheral T cell regulation. J. Clin. Invest. 115: 302-312. Teitelbaum, D., A. Meshorer, T. Hirshfeld, R. Arnon, M. Sela. 1971. Suppression of experimental allergic encephalomyelitis by a synthetic polypeptide. Eur. J. Immunol. 1: 242-248. Keith, A. B., R. Arnon, D. Teitelbaum, E. A. Caspary, H. M. Wisniewski. 1979. The effect of Cop 1, a synthetic polypeptide, on chronic relapsing experimental allergic encephalomyelitis in guinea pigs. J. Neurol. Sci. 42: 267-274. Bornstein, M. B., A. I. Miller, D. Teitelbaum, R. Arnon, M. Sela. 1982. Multiple sclerosis: trial of a synthetic polypeptide. Ann. Neurol. 11: 317-319. Johnson, K. P., B. R. Brooks, C. C. Ford, A. Goodman, J. Guarnaccia, R. P. Lisak, L. W. Myers, H. S. Panitch, A. Pruitt, J. W. Rose, et al 2000. Sustained clinical benefits of glatiramer acetate in relapsing multiple sclerosis patients observed for 6 years: Copolymer 1 Multiple Sclerosis Study Group. Mult. Scler. 6: 255-266. Johnson, K. P., B. R. Brooks, J. A. Cohen, C. C. Ford, J. Goldstein, R. P. Lisak, L. W. Myers, H. S. Panitch, J. W. Rose, R. B. Schiffer. 1995. Copolymer 1 reduces relapse rate and improves disability in relapsing- remitting multiple sclerosis—results of a phase III multicenter, double-blind placebo-controlled trial: the Copolymer 1 Multiple Sclerosis Study Group. Neurology 45: 1268-1276. Miller, A., S. Shapiro, R. Gershtein, A. Kinarty, H. Rawashdeh, S. Honigman, N. Lahat. 1998. Treatment of multiple sclerosis with copolymer-1 (Copaxone): implicating mechanisms of Th1 to Th2/Th3 immune-deviation. J. Neuroimmunol. 92: 113-121. Brenner, T., R. Arnon, M. Sela, O. Abramsky, Z. Meiner, R. Riven-Kreitman, N. Tarcik, D. Teitelbaum. 2001. Humoral and cellular immune responses to Copolymer 1 in multiple sclerosis patients treated with Copaxone. J. Neuroimmunol. 115: 152-160. Duda, P. W., M. C. Schmied, S. L. Cook, J. I. Krieger, D. A. Hafler. 2000. Glatiramer acetate (Copaxone) induces degenerate, Th2-polarized immune responses in patients with multiple sclerosis. J. Clin. Invest. 105: 967-976. Farina, C., F. Then Bergh, H. Albrecht, E. Meinl, A. Yassouridis, O. Neuhaus, R. Hohlfeld. 2001. Treatment of multiple sclerosis with Copaxone (COP): Elispot assay detects COP-induced interleukin-4 and interferon-γ response in blood cells. Brain 124: 705-719. Aharoni, R., D. Teitelbaum, O. Leitner, A. Meshorer, M. Sela, R. Arnon. 2000. Specific Th2 cells accumulate in the central nervous system of mice protected against experimental autoimmune encephalomyelitis by copolymer 1. Proc. Natl. Acad. Sci. USA 97: 11472-11477. Gran, B., L. R. Tranquill, M. Chen, B. Bielekova, W. Zhou, S. Dhib-Jalbut, R. Martin. 2000. Mechanisms of immunomodulation by glatiramer acetate. Neurology 55: 1704-1714. Neuhaus, O., C. Farina, H. Wekerle, R. Hohlfeld. 2001. Mechanisms of action of glatiramer acetate in multiple sclerosis. Neurology 56: 702-708. Dhib-Jalbut, S., M. Chen, A. Said, M. Zhan, K. P. Johnson, R. Martin. 2003. Glatiramer acetate-reactive peripheral blood mononuclear cells respond to multiple myelin antigens with a Th2-biased phenotype. J. Neuroimmunol. 140: 163-171. Chen, M., B. Gran, K. Costello, K. Johnson, R. Martin, S. Dhib-Jalbut. 2001. Glatiramer acetate induces a Th2-biased response and crossreactivity with myelin basic protein in patients with MS. Mult. Scler. 7: 209-219. Chen, M., K. Conway, K. P. Johnson, R. Martin, S. Dhib-Jalbut. 2002. Sustained immunological effects of glatiramer acetate in patients with multiple sclerosis treated for over 6 years. J. Neurol. Sci. 201: 71-77. Vieira, P. L., H. C. Heystek, J. Wormmeester, E. A. Wierenga, M. L. Kapsenberg. 2003. Glatiramer acetate (copolymer-1, Copaxone) promotes Th2 cell development and increased IL-10 production through modulation of dendritic cells. J. Immunol. 170: 4483-4488. Weber, M. S., M. Starck, S. Wagenpfeil, E. Meinl, R. Hohlfeld, C. Farina. 2004. Multiple sclerosis: glatiramer acetate inhibits monocyte reactivity in vitro and in vivo. Brain 127: 1370-1378. Kim, H. J., I. Ifergan, J. P. Antel, R. Seguin, M. Duddy, Y. Lapierre, F. Jalili, A. Bar-Or. 2004. Type 2 monocyte and microglia differentiation mediated by glatiramer acetate therapy in patients with multiple sclerosis. J. Immunol. 172: 7144-7153. Hong, J., N. Li, X. Zhang, B. Zheng, J. Z. Zhang. 2005. Induction of CD4+CD25+ regulatory T cells by copolymer-I through activation of transcription factor Foxp3. Proc. Natl. Acad. Sci. USA 102: 6449-6454. Reddehase, M. J.. 2002. Antigens and immunoevasins: opponents in cytomegalovirus immune surveillance. Nat. Rev. Immunol. 2: 831-844. Sheehy, M., A. McDermott, S. Furlan, P. Klenerman, D. Nixon. 2001. A novel technique for the fluorometric assessment of T lymphocyte antigen specific lysis. J. Immunol. Methods 249: 99-110. Liu, L., A. Chahroudi, G. Silvestri, M. E. Wernett, W. J. Kaiser, J. T. Safrit, A. Komoriya, J. D. Altman, B. Z. Packard, M. B. Feinberg. 2002. Visualization and quantification of T cell-mediated cytotoxicity using cell-permeable fluorogenic caspase substrates. Nat. Med. 8: 185-189. Lecoeur, H., M. Fevrier, S. Garcia, Y. Riviere, M. Gougeon. 2001. A novel flow cytometric assay for quantitation and multiparametric characterization of cell-mediated cytotoxicity. J. Immunol. Methods 253: 177-187. Azuma, M., M. Cayabyab, J. H. Phillips, L. L. Lanier. 1993. Requirements for CD28-dependent T cell-mediated cytotoxicity. J. Immunol. 150: 2091-2101. Martinozzi, S., R. Pacasova, H. J. Boulouis, M. Ulbrecht, E. H. Weiss, F. Sigaux, M. Pla. 1999. Cutting edge: requirement of class I signal sequence-derived peptides for HLA-E recognition by a mouse cytotoxic T cell clone. J. Immunol. 162: 5662-5665. Borrego, F., M. Ulbrecht, E. H. Weiss, J. E. Coligan, A. G. Brooks. 1998. Recognition of human histocompatibility leukocyte antigen (HLA)-E complexed with HLA class I signal sequence-derived peptides by CD94/NKG2 confers protection from natural killer cell-mediated lysis. J. Exp. Med. 187: 813-818. Li, J., I. Goldstein, E. Glickman-Nir, H. Jiang, L. Chess. 2001. Induction of TCR Vβ-specific CD8+ CTLs by TCR Vβ-derived peptides bound to HLA-E. J. Immunol. 167: 3800-3808. Fridkis-Hareli, M., J. M. Neveu, R. A. Robinson, W. S. Lane, L. Gauthier, K. W. Wucherpfennig, M. Sela, J. L. Strominger. 1999. Binding motifs of copolymer 1 to multiple sclerosis- and rheumatoid arthritis-associated HLA-DR molecules. J. Immunol. 162: 4697-4704. Viglietta, V., C. Baecher-Allan, H. L. Weiner, D. A. Hafler. 2004. Loss of functional suppression by CD4+CD25+ regulatory T cells in patients with multiple sclerosis. J. Exp. Med. 199: 971-979. Sercarz, E., E. Maverakis, P. van den Elzen, L. Madakamutil, V. Kumar. 2003. Seven surprises in the TCR-centred regulation of immune responsiveness in an autoimmune system. Novartis Found Symp. 252: 165-171. Jiang, H., H. Kashleva, L. X. Xu, J. Forman, L. Flaherty, B. Pernis, N. S. Braunstein, L. Chess. 1998. T cell vaccination induces T cell receptor Vβ-specific Qa-1- restricted regulatory CD8+ T cells. Proc. Natl. Acad. Sci. USA 95: 4533-4537. Zhang, J., R. Medaer, P. Stinissen, D. Hafler, J. Raus. 1993. MHC-restricted depletion of human myelin basic protein-reactive T cells by T cell vaccination. Science 261: 1451-1454. Madakamutil, L. T., I. Maricic, E. Sercarz, V. Kumar. 2003. Regulatory T cells control autoimmunity in vivo by inducing apoptotic depletion of activated pathogenic lymphocytes. J. Immunol. 170: 2985-2992. Lehner, P. J., P. Cresswell. 2004. Recent developments in MHC-class-I-mediated antigen presentation. Curr. Opin. Immunol. 16: 82-89. Ackerman, A. L., C. Kyritsis, R. Tampe, P. Cresswell. 2005. Access of soluble antigens to the endoplasmic reticulum can explain cross-presentation by dendritic cells. Nat. Immunol. 6: 107-113. Appay, V., P. R. Dunbar, M. Callan, P. Klenerman, G. M. Gillespie, L. Papagno, G. S. Ogg, A. King, F. Lechner, C. A. Spina, et al 2002. Memory CD8+ T cells vary in differentiation phenotype in different persistent virus infections. Nat. Med. 8: 379-385. Brenchley, J. M., N. J. Karandikar, M. R. Betts, D. R. Ambrozak, B. J. Hill, L. E. Crotty, J. P. Casazza, J. Kuruppu, S. A. Migueles, M. Connors, et al 2003. Expression of CD57 defines replicative senescence and antigen-induced apoptotic death of CD8+ T cells. Blood 101: 2711-2720. Walker, M. R., D. J. Kasprowicz, V. H. Gersuk, A. Benard, M. Van Landeghen, J. H. Buckner, S. F. Ziegler. 2003. Induction of FoxP3 and acquisition of T regulatory activity by stimulated human CD4+CD25− T cells. J. Clin. Invest. 112: 1437-1443.